In 1897, the Union Dry Dock Co. in Buffalo built a tugboat. In the years following, the tugboat sank (twice) and was raised, burned (twice) and was rebuilt. Today, after 121 strenuous years, the same tug is still at work, deftly assisting far larger ships in and out of the port. When it comes to tough workboats, the Wisconsin is in a class all its own. The Wisconsin, some say, is also haunted. In her history Soul of a Port: The History and Evolution of the Port of Milwaukee (The History Press 2010) author Leah Dobkin relates several eerie encounters experienced by the Wisconsin’s crew. Dobkin also quotes the tug’s captain saying he isn’t troubled by talk of ghosts. If they exist, he said, they’re probably friendly enough. 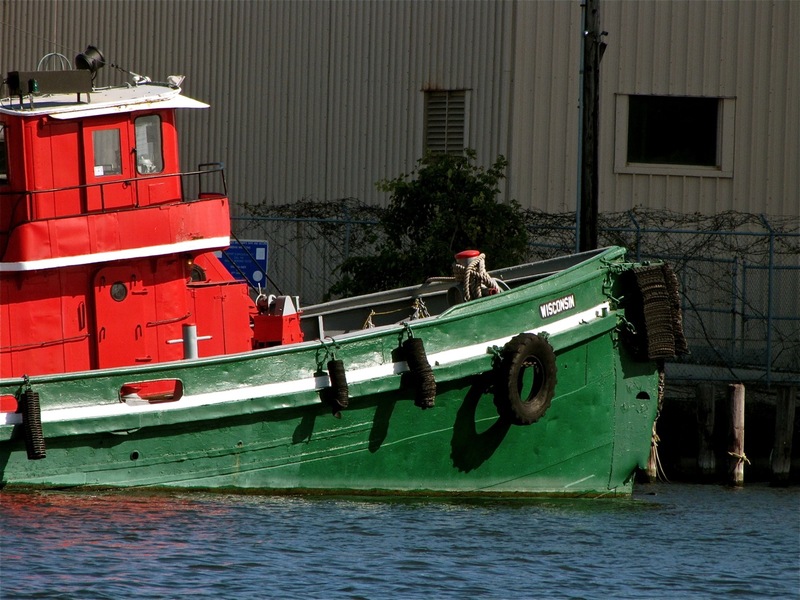 Traditional-style tugboats are distinctive-looking vessels. They have wide, round, deep-riding hulls for maximum stability. The low stern keeps lines close to the water for safer towing. The small superstructure gives its crew plenty of deck space all around for line handling and allows the tug to nestle under the curving hulls of bigger ships. It’s a purely functional design but its long-ago builders managed to give the Wisconsin elegant, flowing lines. 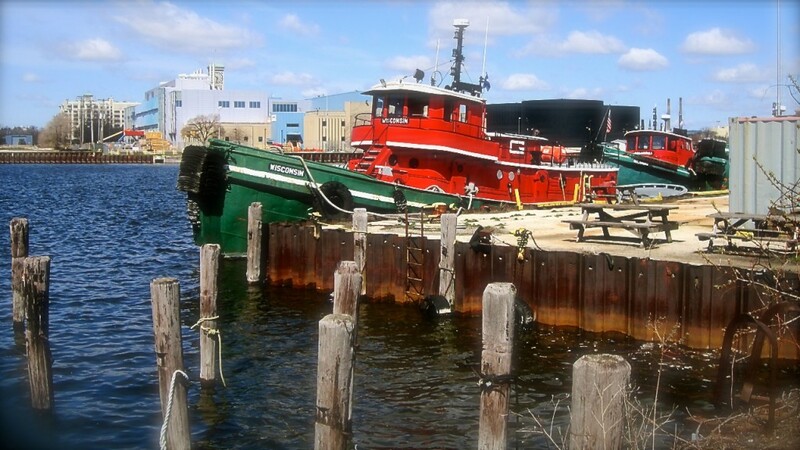 More practically, this tug is known for its unusually good handling characteristics in rough weather (the Wisconsin is “a good sea boat,” in lake jargon). Since tugboats are usually seen alongside much larger ships, it’s easy to forget that they are not necessarily small themselves. The Wisconsin is 83 feet long, 21 feet wide, and its diesel engine produces more than 1,000 horsepower. For all their great stability and power, tugboats are potentially hazardous places to work. They perform the most demanding tasks in the maritime world, day or night, and frequently in harsh weather. Ghosts are far down the list of things tugboat captains worry about. They know tragedy can strike at any moment – even when you do everything right. It happened to the Wisconsin. In fall 1941, a freighter named the B.F. Jones with a capacity load of iron ore blundered onto a clay bank off the east end of Belle Isle in the Detroit River and stuck fast. The Wisconsin – it was then named the America – her sister tug Oregon, and several other vessels were dispatched to free the grounded freighter. The Oregon tied a heavy towline to bow of the America, which, in turn, attached its own towline to the Jones’ anchor. The two tugs started pulling the anchor further into the river as the big freighter slowly fed out anchor chain. Once the anchor was reset, the Jones could assist in pulling itself free by winding in its anchor chain. It was 2 a.m. on Oct. 23, 1941. Some of the tugboat’s crew were at their duty stations, others were asleep in their bunks. Inexplicably, the Jones’ suddenly stopped feeding out anchor chain. Before the Oregon could react, the America, jerked to a violent halt, rolled upside down, kept rolling until it was right side up, and then sank – all within five seconds. Seven men aboard were rescued including the captain of the tug, who escaped by smashing the pilothouse windshield with his fists – seriously injuring himself in the process – and he dragged a company supervisor to the surface with him. Six others drowned in the submerged vessel. Raised and repaired, the tugboat went right back at work. On June 27, 1946, the future Wisconsin went to the assistance of the grounded United States Gypsum, stuck on a sandbar just off Marysville, Mich. As it maneuvered near the freighter, the tug ripped its hull open on an underwater obstruction and sank within minutes. There was no loss of life, not even an injury. Patched, pumped out, and towed to the Great Lakes Towing shipyard in Cleveland for an overhaul, the tug was soon back on the job. In 1950, it was converted from steam to diesel power. In 1979, while docked in Detroit, arsonists broke in, poured gasoline throughout the interior, and set fire to the tug. When firefighters arrived, the boat was a solid mass of flame from bow to stern. Once the fire was out, mechanics pumped out the water used to extinguish the fire, sealed doors and windows, and prepared the tug for towing to its parent company’s shipyard in Cleveland. This work took all day. That night, the arsonists returned and set the tug on fire a second time. For six months the burned-out hulk sat in Cleveland. The tug was 82 years old. It had worked ’round the clock through two world wars and finally its end seemed to at hand. However, the management of Great Lakes Towing surprised many observers by announcing it would restore the boat to service. 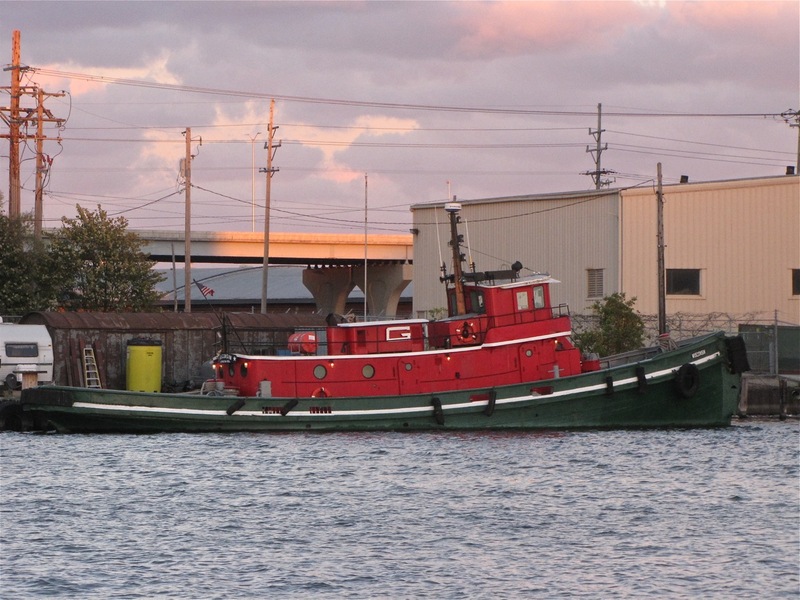 Renamed the Wisconsin in 1983, the tug has called the Port of Milwaukee home in recent years. The year it was launched, 1897, Grover Cleveland was in the White House, Mark Twain was alive, and the Klondike gold rush was under way. Against all odds, the Wisconsin endures – not a museum piece, but a working craft. Battered, bruised, sunk, burned, and haunted, it’s been an eventful 121 years – and the story of the Wisconsin has a few more chapters yet to be written. Many of the facts in this article are taken from a 1997 centennial history of the Wisconsin written by Great Lake historian and author Dr. Alexander C. Meakin. Glad her fate was better than the Favorite’s. I was able to tour this tug a few years ago after meeting the captain while on a bike ride on Jones island. The diesel engines that most tugs were retrofitted with came from the landing craft used during WWII which were never expected to survive. Loved this article. I worked in the UW-Milwaukee Geology Dept and we did a lot of geophysical research, on the Great Lakes, and in smaller inland lakes. A tugboat would have been a perfect research vessel on the Great Lakes, lots of deck space, and easy handling of devices going overboard. We had a 25 foot aluminum research boat that we used for surveys on western lakes and the Mississippi River. I even slept overnight on a tug. Can’t really remember where, but perhaps in Cheboygan, Michigan.